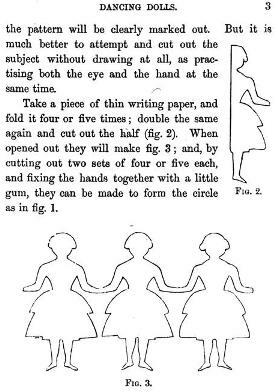 This page attempts to record what is known about the origin and history of the fold and cut design known as the Chain or String of Dolls. Please contact me if you know any of this information is incorrect or if you have any other information that should be added. Thank you. 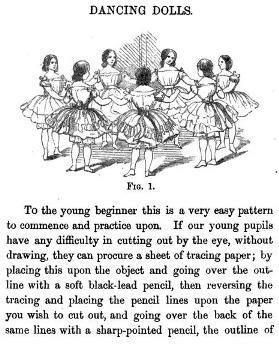 The earliest diagrams that I am aware of for the Chain of Dolls appear in 'The Girl's Own Toymaker' by Ebenezer and Alice Landells which was published in 1860 by Griffin and Farran in London and Shephard, Clark and Brown in Boston. 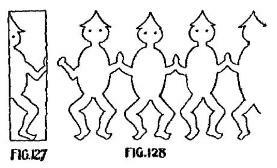 A 'Group of Dancing Brownies' is included in 'Paper Magic' by Will Blyth, which was first published by C Arthur Pearson in London in 1920.